This is an hour long programme that contains a years worth of student instruction and rehearsal material. In between the teaching segments are evocative landscapes which help set the didgeridoo into the landscape from where it comes. The programme also contains three animated play along rehearsal pieces that are designed to be used repeatedly. 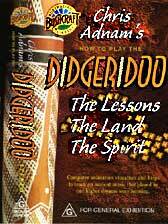 The didgeridoo notes are animated across the bottom of the screen displaying the variety of voices, durations and rhythms. The intention is for you to turn off the audio and play along to the animated notation as you serenade the landscape. We have segments that explain the creation of 'voices' from the Australian bush, but we suggest how you can make these voices from your own environment.